Despite some notable chop/weakness since the start of the year, US equity indexes are continuing their broad climb from the Oct'2011 low of sp'1074. 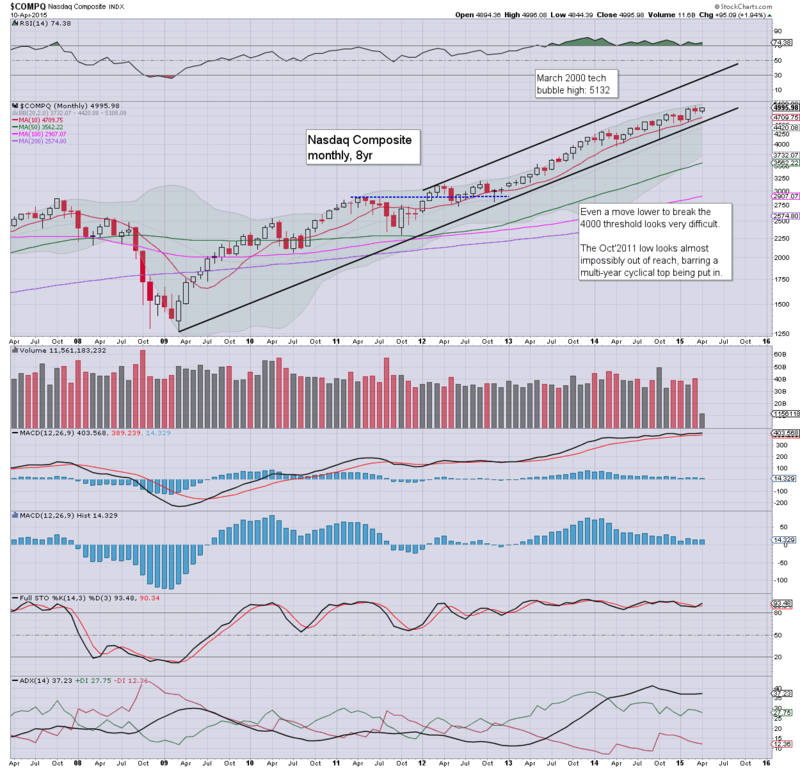 The monthly upper bollinger is offering equity bulls the 2170s in May/June... and it has to be asked.. why would it stop there? Without question, it has been a real battle so far this year, with notable weakness in January and March. 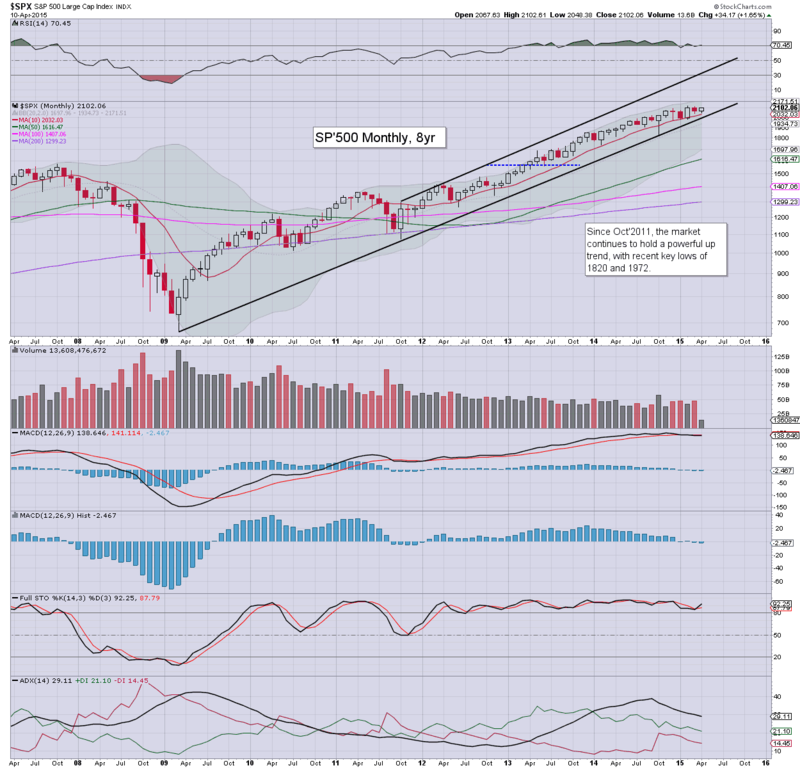 The sp'500 is already higher by 1.6% this month, and new historic highs look due before end month. There will be stiff resistance in the 2130s, but there looks to be viable upside to the 2150/75 zone before the FOMC of June'17th. Underlying MACD (blue bar histogram) remains negative cycle.. which is certainly important to note, but overall price action remains broadly bullish. Key support is now the giant 2K threshold on the weekly.. as well as the monthly cycle. 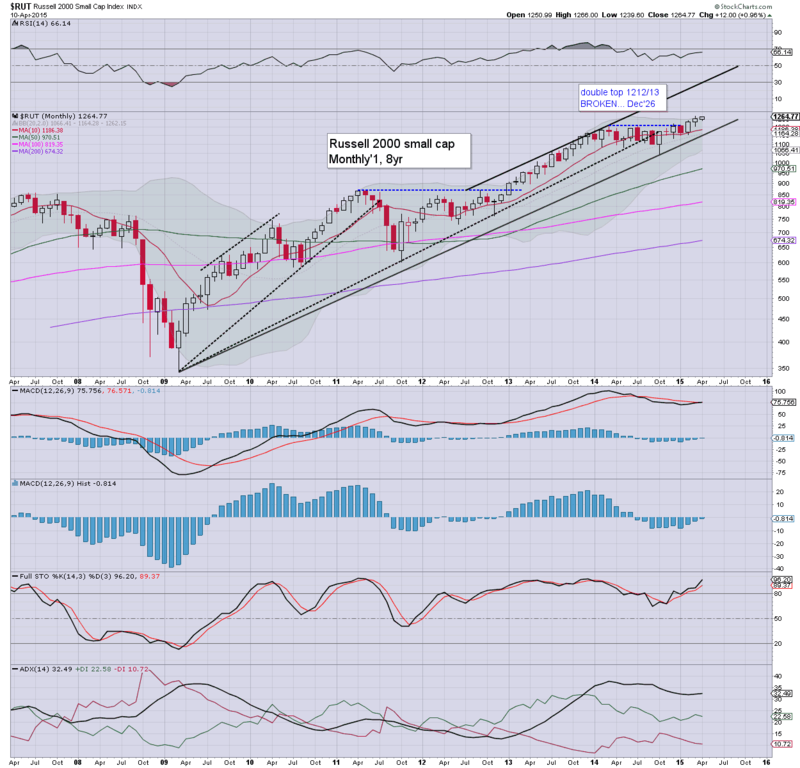 The Nasdaq settled the week at 4995.. and looks set to be again trading in the 5000s next week. 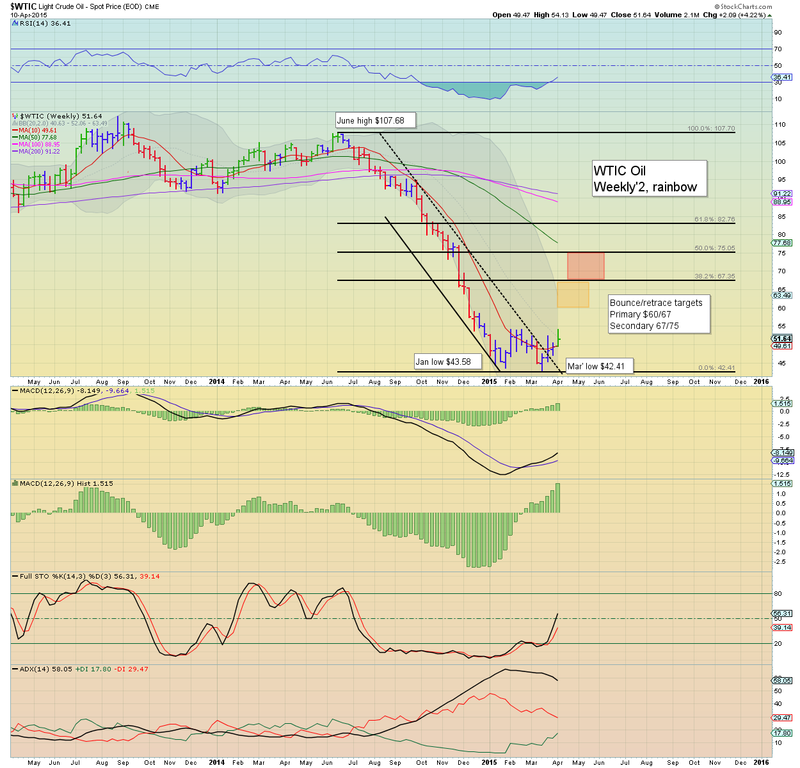 Next key target is the March'2000 high of 5132. 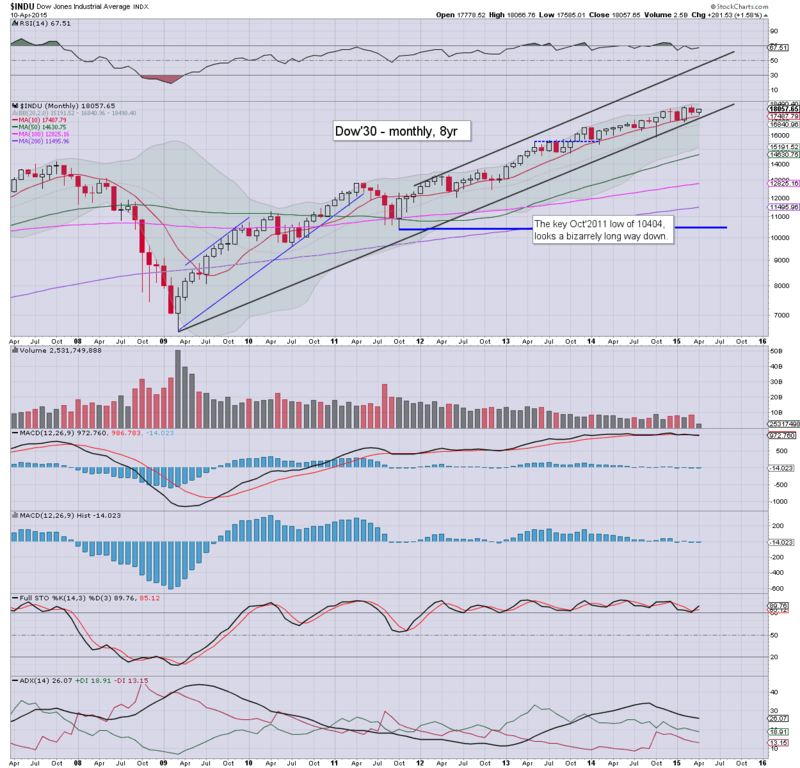 A monthly close in the 5200s would offer a straight run to 6K by year end. There is simply nothing bearish here. The mighty Dow managed a weekly close above the 18K threshold. 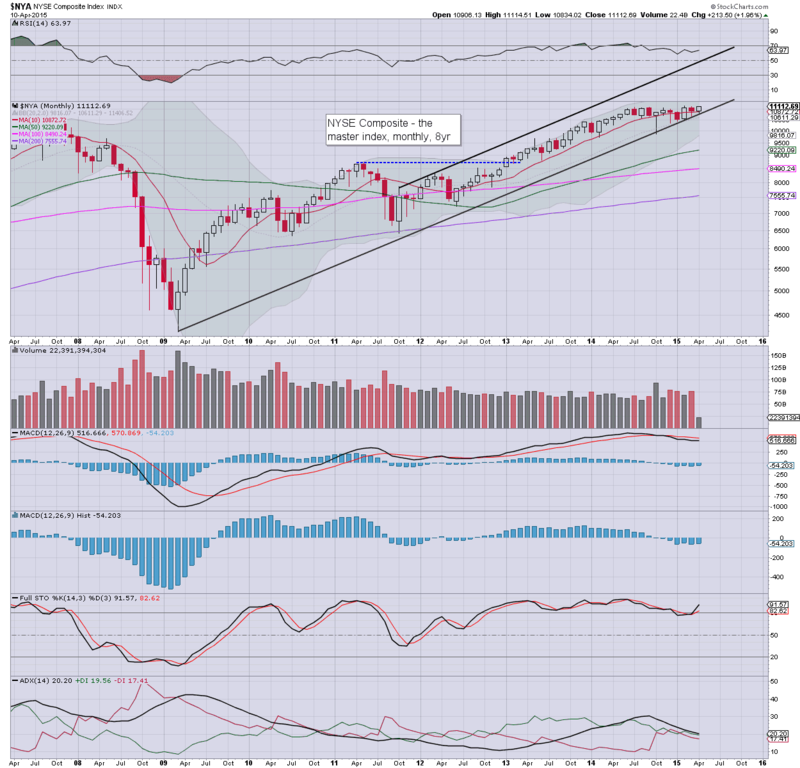 There looks to be upside to the 18400/600 zone by June... but 19k is clearly out of reach for some months. The giant 20K threshold.. that is going to be a tough challenge for the market. Underlying MACD cycle remains moderately negative, but price action is certainly still broadly bullish. First support is around 17500, with secondary at 17k. Under no 'reasonable' outlook does it look viable for the Dow to be trading sustainably under 15K this year. The master index is a mere 30pts shy of breaking a new historic high (11142), and indeed, that looks due next week. There is viable upside to the 11300/500 zone this May/June. It is notable that the MACD cycle has been negative for SIX consecutive months, whilst price action has remained largely stuck since last June - the time when Oil maxed out. The second market leader is now higher for the third consecutive month... climbing away from the old support zone of 1150/1200. There looks to be upside to 1275/1300 by June. Underlying MACD cycle is set to turn positive in May.. which will be a particularly bullish event. The 'old leader' has been in a very slow decline since maxing out last November (9310). Indeed, underlying MACD cycle has now turned bearish - the first time since Dec' 2012. Upper monthly bollinger is offering the 9400/600s into the early summer, but that is going to be tough for the Transports to achieve, not least if Oil prices start rising (first target is WTIC $60). 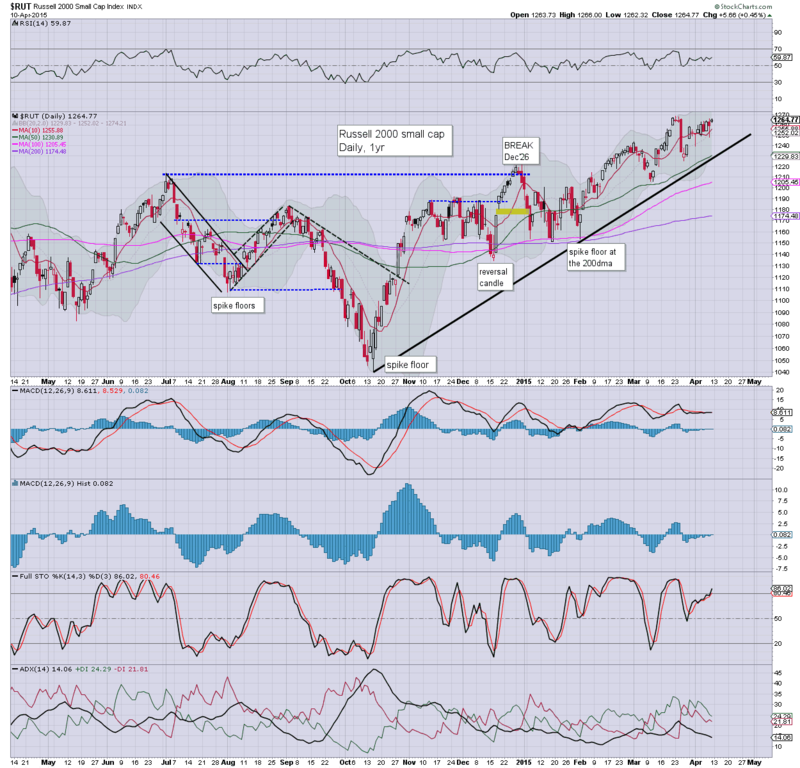 Without question, the broader trend remains powerfully bullish. Yes, there is notable weakness in the NYSE Comp' and Transports, but even they are trading close to their historic highs. Perhaps most notable.. the Nasdaq.. which is getting close to breaking a new historic high (>5132) within the next month or two. With continuing stock buy backs, QE from various central banks, and low bond yields... it would seem equities will continue rising.. at least into early summer. Whether there is going to be an intermediate (wave 4, D, Y, or whatever you might wish to call it) correction this year.. right now, that is extremely difficult to ascertain. My guess is that even if such a down wave does occur, it will probably be very sharp... but especially brief, and difficult to trade. The best analogy I could suggest anyone consider would be the down wave in 1998. Anyway... for now.. the trend remains powerfully bullish. This is no market for the bears. A pretty busy week is ahead..
*there are a sprinkling of Fed officials across the week, esp' on Thursday.. and one of them is even here in my home city of London. With a net Friday gain of $0.89 (1.75%) to $51.64, WTIC Oil saw the first outright bullish candle on the weekly cycle since the peak of June 2014. Near/mid term outlook is now bullish.. at least to $60... and probably $67. 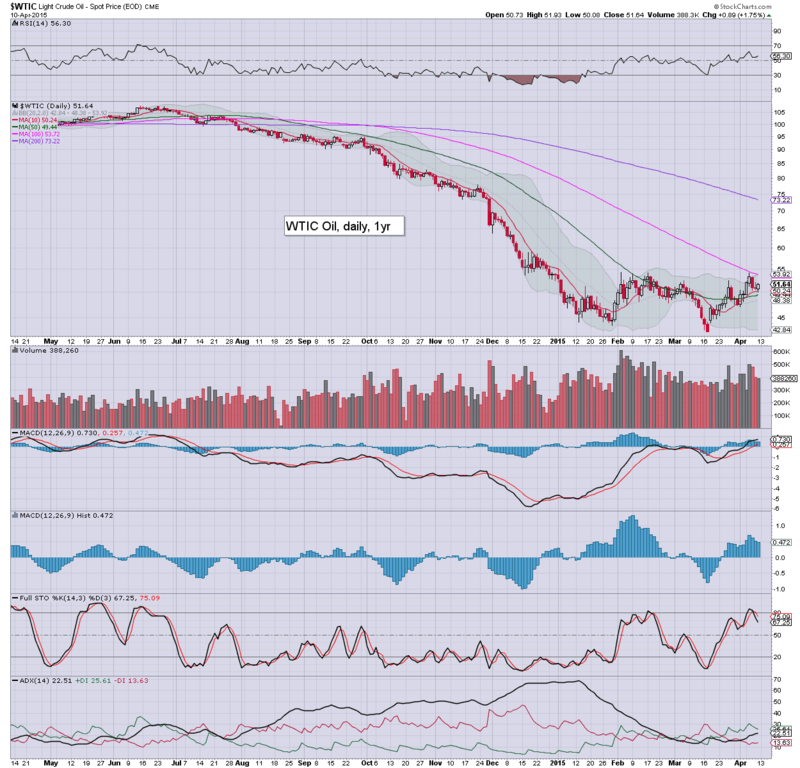 However, with supply issues not yet addressed.. Oil will not likely break/hold above $75 this year. *a VERY significant green candle for Oil on the weekly 'rainbow' chart. Certainly, I think Oil could drop 2-3% next Monday (to fill a key price gap).. but overall... the mid term trend is now bullish. 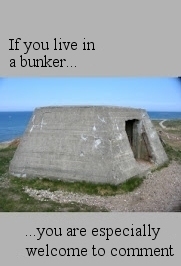 To be clear, with supply still too high... I think that whatever multi-week/month up move we see this spring/summer, it should be seen as a bounce/retrace... and not that a key floor has been put in. I will consider going long Oil next Mon/Tuesday on any weakness... but a more interesting trade later this summer would be a re-short... somewhere in the $67/75 zone. 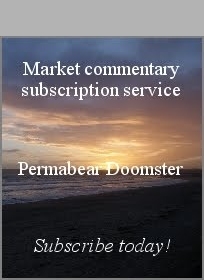 The market ended the week on a pretty positive note, sp +10pts @ 2102. The two leaders - Trans/R2K, settled higher by 0.7% and 0.4% respectively. 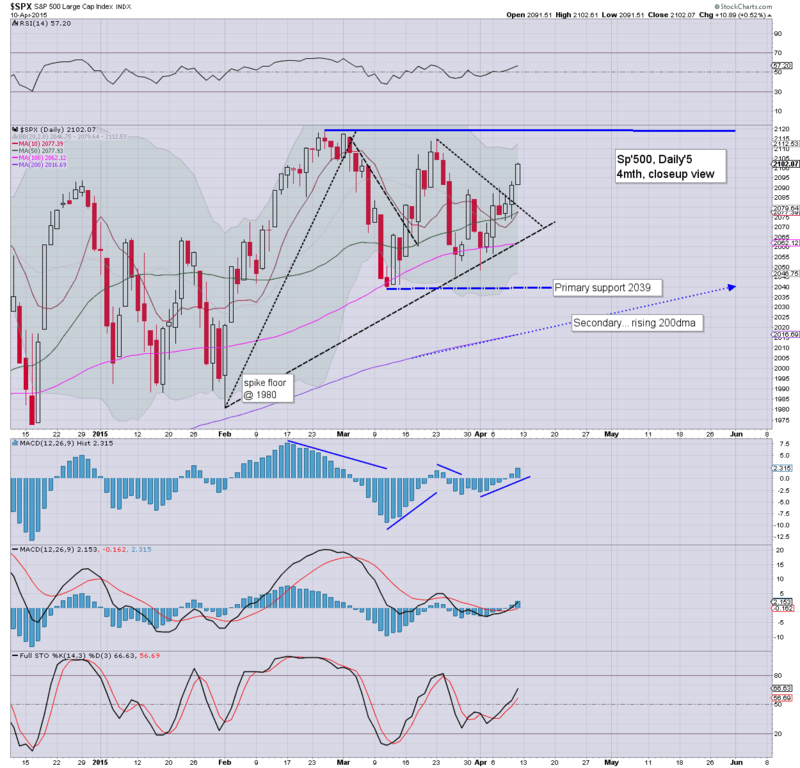 Near term outlook is bullish... with viable upside to the 2150/75 zone by late May. This is simply... no market for the bears. All daily MACD (blue bar histogram) cycles are turning upward.. and bode for further upside next week. 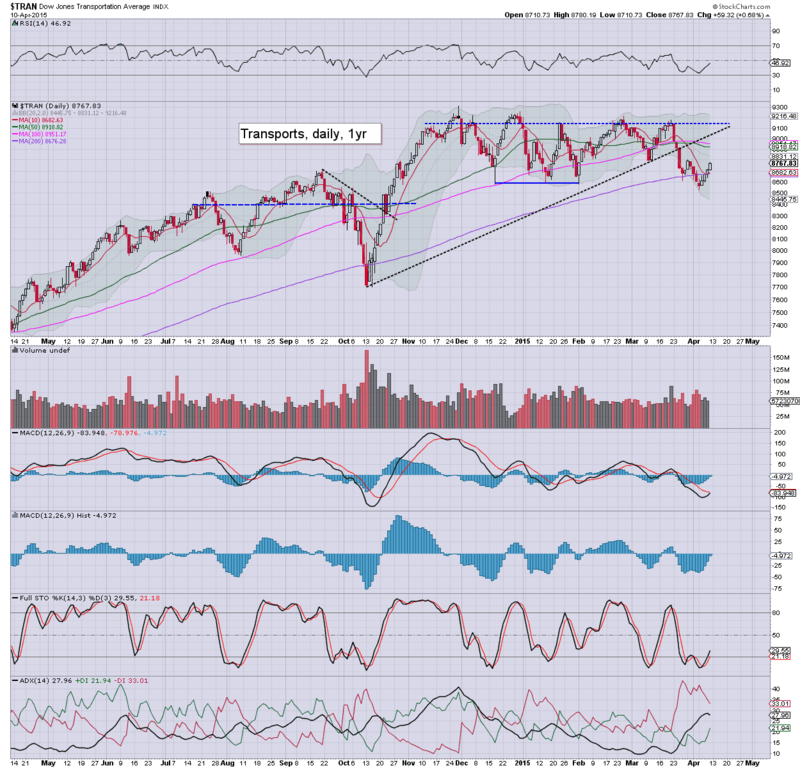 One interesting thing will be whether the Trans can break a new high in May... or June. 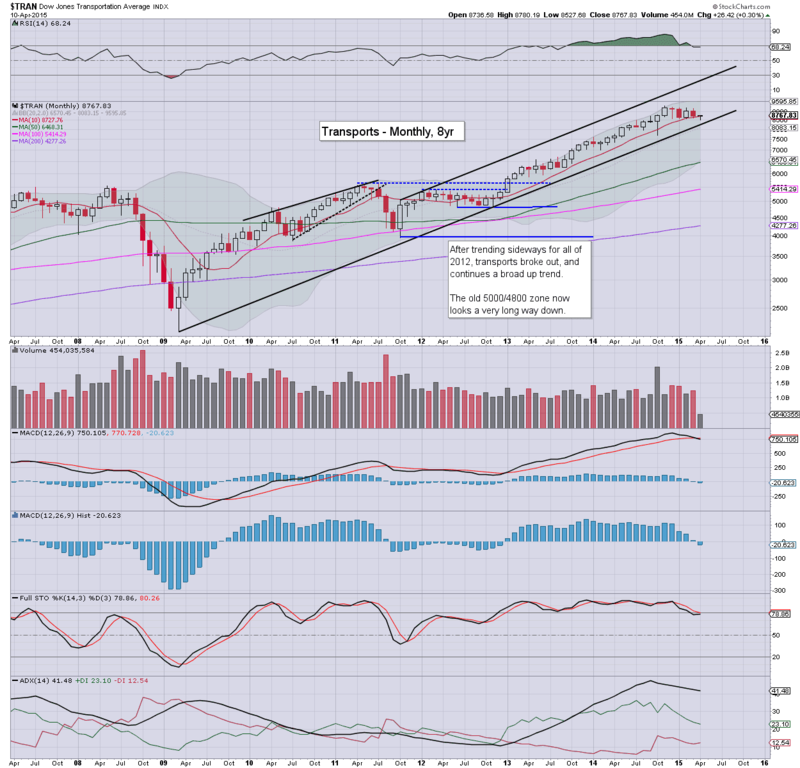 As 'old leader', Trans continues to warn that all is not quite as bullish as things might seem.